Discussion in 'BushClass USA' started by IA Woodsman, Apr 27, 2011. Teeps, agranite and Forestree like this. Went for a short day hike in search of cedar or birch trees. Didn't find any because they are very rare in my area. Then had a fire and cooked up a little something. Went out this morning in the rain to practice creating feather sticks with a large knife. It was nice out, I haven't been out while it was actively raining in a while. Teeps, Not Sure and Forestree like this. Outing 2: Got out to the woods and decided to practice using my man-made tender. I got two cotton balls soaked in vaseline out and was able to quickly get them lit using my fire steel. 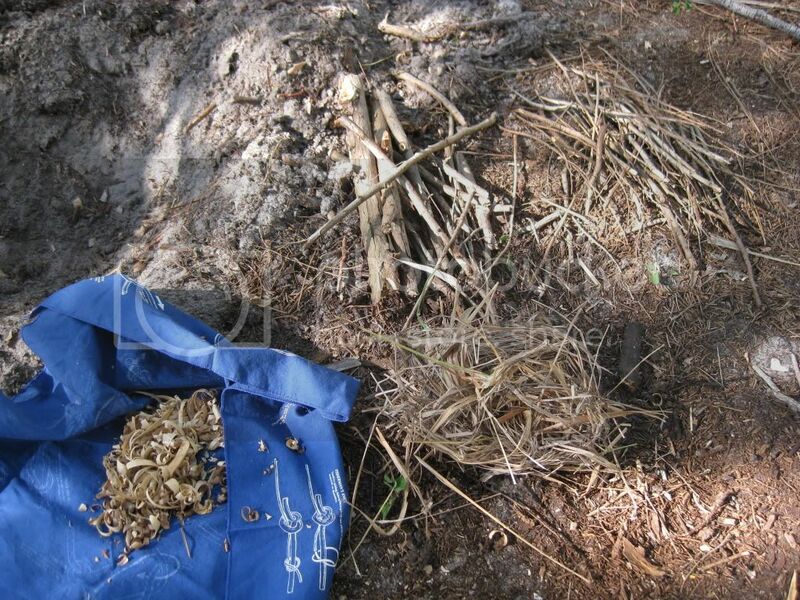 I gathered nothing but twigs and thumb size sticks off the ground and built a stabilized fire. Teeps, Not Sure, agranite and 1 other person like this. Outing 4: Today I went out and practiced making a pot hanger again. I've been practicing my skills for about six years and it's funny that I have completely neglected improvising pot hangers. I'm really enjoying crafting them in the field, so that's a big thank you to Bushclass right there. I also sharpened my knife while I was in the woods. Teeps, Revinmama, Not Sure and 2 others like this. I finished my classes in time for my overnight this weekend. I went to a little spot not far from my house. I set up my tarp shelter and used the ridge line I made. For my fire I made some feather sticks and collected twigs. I used the flint and steel to light the char cloth I made. 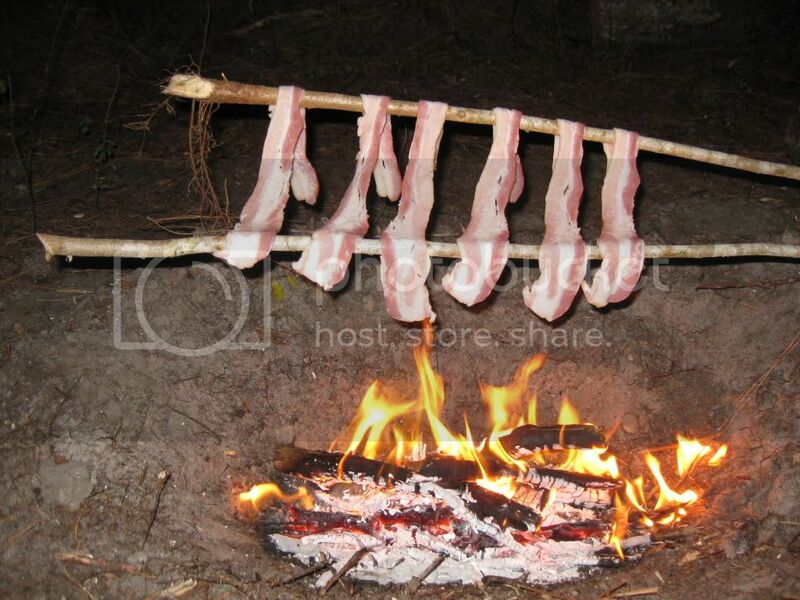 For dinner I made some bacon over the fire. I tried to fry up some bannock but I burnt it pretty bad. 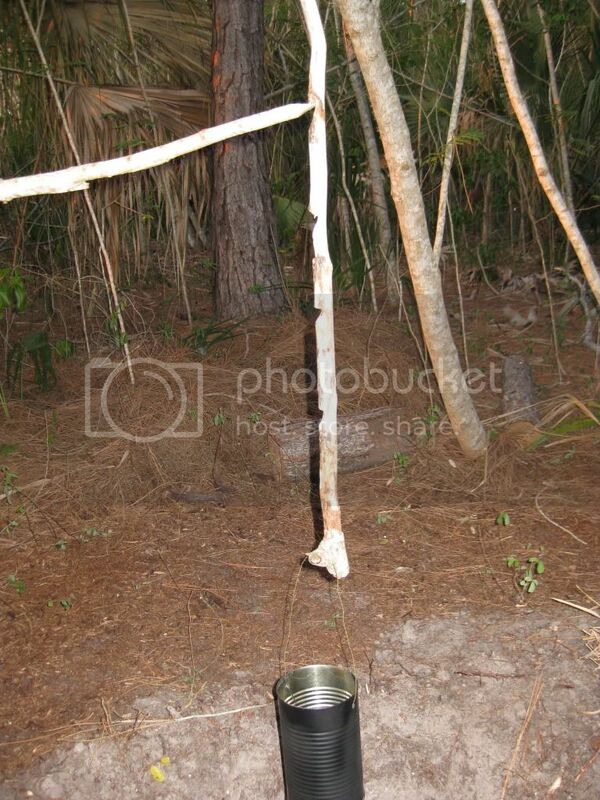 To boil the water for my Mountain House I made a pot hook and used the metal cooking pot I made. I ran into this little guy. When I got closer he took off before I could snap a pic. I had fun using all the skills I learned here. Thanks to all of you who took time to post lessons and gave me the motivation to do my first overnight of 2011. I know that this post is years old, however I am researching for my outings. Your post is quite the example of showing the skills we have learned so far on your outings. You have set the bar for me. Well done sir! 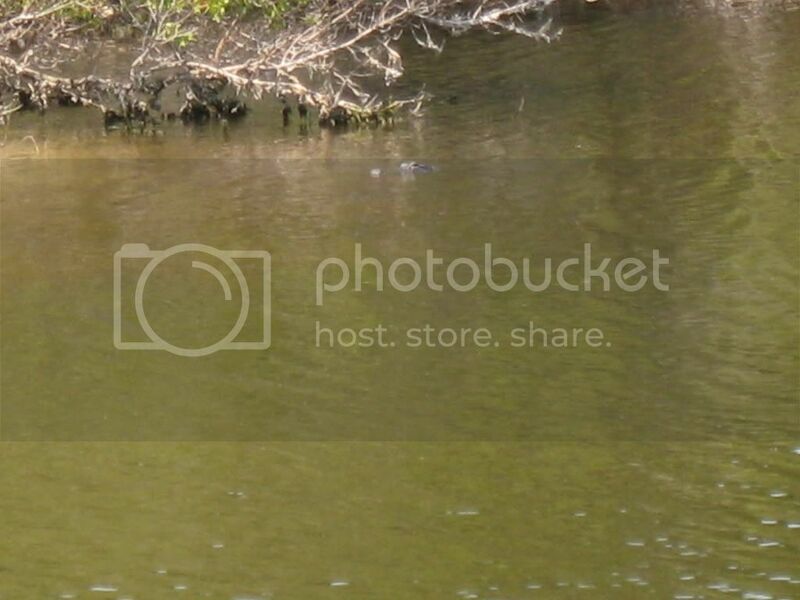 AND... Are you gonna camp next to an alligator pond?! I guess you are safe enough in your hammock? We don’t have much that’s gonna eat us in Missouri other than Mountain lions and bears, and even they are hard to find. Hit me up if you are still active. Outing 5 (overnighter): Spent my overnighter at the Lake Houston Wilderness Park. All the lessons taught in Bushclass Basic really came together fot this outing. I used knot tying, shelter building, firecraft, and cooking to accomplish this trip. Thank you Bushclass, I am excited to continue onto the next part! Found some evidence of squirrels feasting.. Very short outting, but still great to get woods time in, even if it's on a lunch break. Teeps, CO Tree Hugger and Forestree like this. 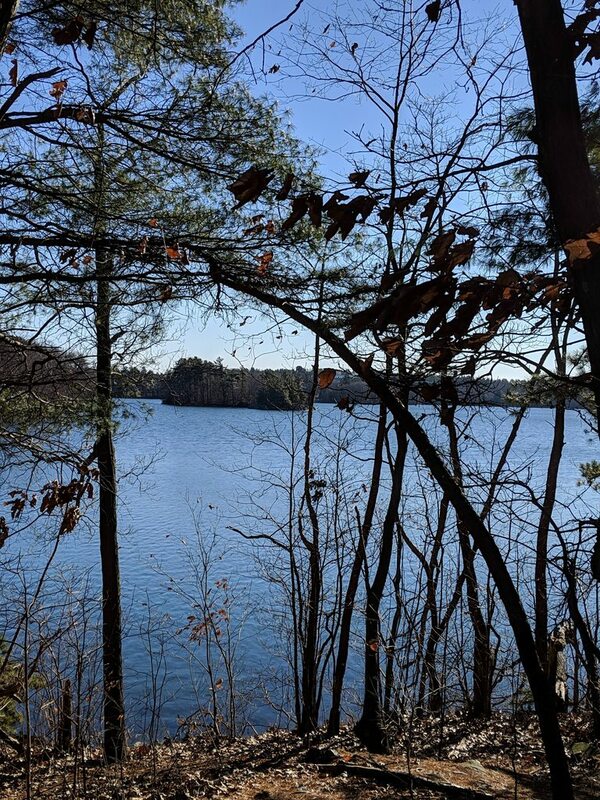 Today I took a walk around the pond where I fish to play around with a new field guide I got (more on that in a moment), see how the ice was progressing, and see how the late season storms treated the area. There were quite a few downed trees and limbs, but I only found one that looks like it was alive when it came down. It was really nice to get outside again. I also found a good spot where I can redo my tarp shelter lesson. For that lesson I kind of made an emergency last minute oh-no-get-out-of-the-rain! shelter and I'd like to do something with a ridge line and all. It'll just make me feel better about the submission. A big part of the premise of this book is that the typical identifiers of trees in this area, like leaves and buds, are not visible most of the year. Also, twig patterns tend to be tougher to see due to height. But bark? That's eye level. The challenge is that it varies throughout a tree's lifetime. When I found this book on Amazon it really appealed to me for whatever reason and, a year later, I bought it. As ever, I'm pretty bad about taking pictures in the moment and can only describe the fun I had. The best part for me was identifying a young silver maple. Young silver maples have such different bark from mature ones that it looks like a totally different tree to me. Without the leaves, I really wasn't sure what I was looking at until I took out the guide book and went through the steps in the key. So that was fun. Teeps, Paul Caruso, CO Tree Hugger and 3 others like this. My camera is giving me problems and some of my pictures are not recording,so this will be two field trips made into one trip. I was out looking for some Sage to make a bow-drill kit. Very common here in Central Wa. Sagebrush bark, excellent tinder. Spindle and Fireboards. I also grabbed some leaves to toss on the fire, Incense of the Ancients. Part 2 of trip 1. @IA Woodsman made a really good video of a wet twig bundle fire and I wanted to try it. 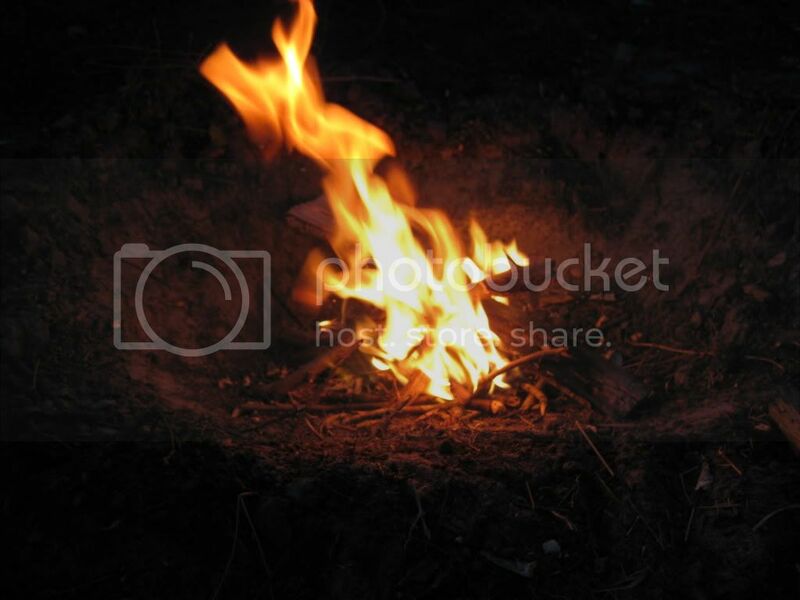 So here is my fire in pictures. This was a valuable lesson for me, in days past I would have wasted time making and splitting out feather sticks. Teeps, CO Tree Hugger, Brew-Jitsu and 3 others like this. Bushclass Outing #5! I can't wait to start Intermediate! Teeps, notoiletpaperinthewoods, Not Sure and 2 others like this. Time in the great outdoors was needed and so I packed up 8 of our sled dogs and went to Fish Lake, one of my favorite areas near Whitehorse. The north end had an ok amount of snow on the lake ice, and so I went happily along the east shore. My plan was to do some icefishing and try a few new spots...however, that didn't go so well. After only about 2 miles down the lake the snow got thinner and thinner and eventually disappeared almost entirely and we were just scooting around on glare ice. With no snow cover it was beautiful to see the cracks and air bubbles in the ice...and just darknesss underneath. Due to temperature changes, which cause expansion and contraction in the ice, there was a constant cracking and snapping sound in the lake ice. Some of the dogs got a little spooked, but we managed. My biggest issue with the glare ice was the fact, that you basically cannot stop! I tried many times, but there was no way to set the snow hook...and I had forgotten my axe in the truck...and so the dogs kept pulling. With an axe I could have chopped a little ice away to create a hole for hooking down...lesson learned: Don't go on the lake without axe! Well, actually don't go anywhere without your axe...hey, I already knew that! Since I couldn't stop the dog team, I just kept running them zig zag across the lake and around and back etc. and enjoyed the scenery, instead of fishing. Teeps, Coyote Charlie, baglock1 and 1 other person like this. Teeps and Revinmama like this. I finished up my last Basic lesson this morning and immediately went out for a walk in the desert. The kids, after helping me set the tarp up, decided they wanted to come with me. While out there, I ID'ed some of the common desert plants as well as Mormon Tea (Ephedra nevadensis). I went ahead and cut some off for use in tea. It just so happens, I brought a tin can with me for tea. Gee, maybe I planned that...? Shaved some mesquite for the fire and used a baddest bee fire fuse to get it lit with my fire steel. Steeped and ready to try. Honestly, it's not bad but it's a bit bland. Additionally, I had intended on cooking some lunch over the fire but the kids were getting antsy so I decided not to push my luck with their patience. Teeps and notoiletpaperinthewoods like this. Here will be my postings for the outings. If need be I can locate my other outings. Most of them are not in their own thread, but apart of other threads as a single post. Teeps, CivilizationDropout and notoiletpaperinthewoods like this. Hmmm... no point in going out in the woods till I get the lessons finished up then... just kidding. I don’t go just to get magic bushcraft forum points! At least now I have a place picked out for the tarp tent setup! Teeps and Young Blacksmith like this. I went ahead and drove up to the Gila Mountains in Western New Mexico for this one. It's still pretty cold up there but I didn't expect it to get real cold. I was expecting lows in the high 20s. It actually dropped down to the high teens and I was pretty cold. I wasn't in danger, but I wasn't comfortable either. In retrospect, I should have made my fire close to the shelter but was using an existing fire ring and was stuck with the trees being ~20' away. Additionally, because I got a late start, it was fully dark by the time I got into the area I planned to camp in. 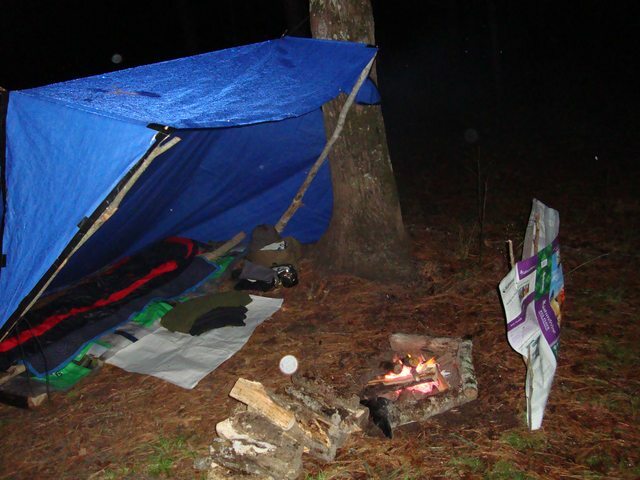 As a result, I didn't get pictures of me setting the tarp up or getting my fire built and dinner prepared. I did make another fire in the morning just for picture proof of a fire being made. So with all that said, on to the pictures! Here was home for the night. There was no wind and no rain or snow to speak of so I really didn't need the tarp but I went ahead and set it up anyways. 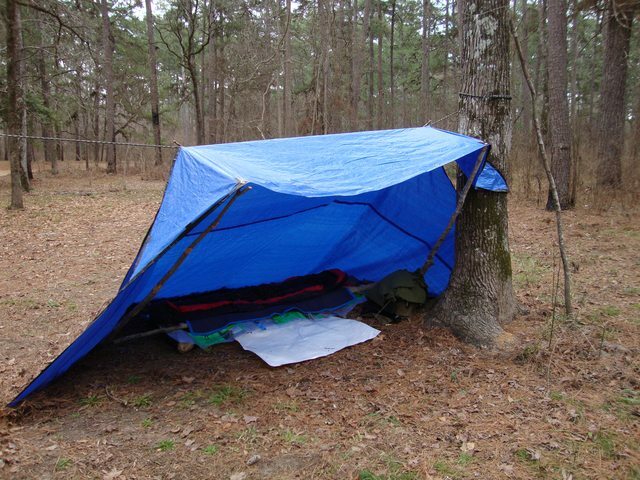 It is a 10x12 BCO silnyl tarp in coyote. 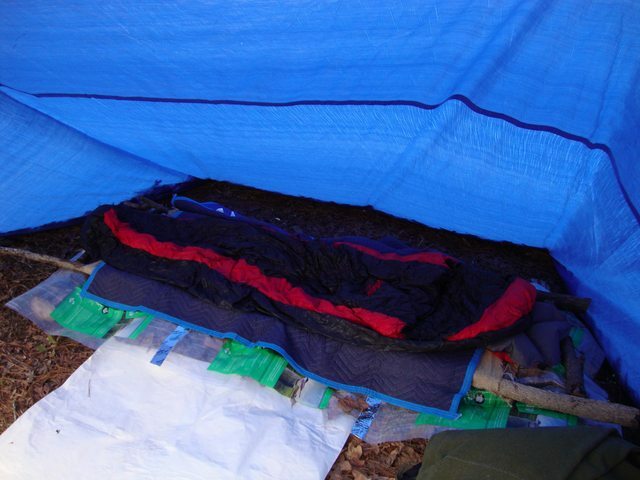 Bedding consisted of my 20* Kelty bag and Big Agnes pad. Due to the weather, I was bundled up in my poly-pros (thermal underwear) and my normal clothes as well. I used figure 8 knots for the loops I made prusiks out of. I used the ridgeline I made from the elective lesson and prusiks for the top. I used a small section of wood for the toggles. 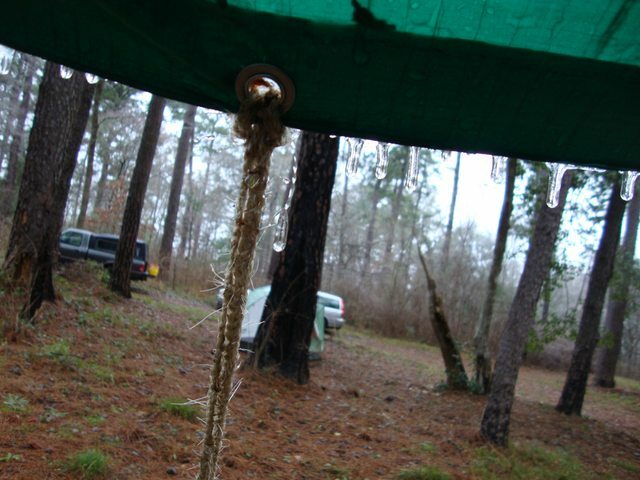 For the tie-outs, I used a combination of the basic lesson knots, including half hitches and taut lines. Also, I had some short pieces of paracord that I used sheetbends to connect and make longer (sorry for focus on this one). I found a stump with some fatwood in it about 40' from camp. I used it to get the fire started the previous night. I used some more for building a fire the next day to demonstrate my technique. Here's my fire lay. Since I didn't plan on keeping this fire going, I set it on ice to keep from igniting any ground cover and ease in putting it out afterwards. With that in mind, I didn't use a platform (I did use one the previous night). I did throw down a bunch of oak leaves to keep the wood dry for a little longer. I used fatwood feathers and some dried out seed pods for tinder. The fatwood actually took a spark from the ferro rod before the tinder did. This stuff went up FAST. So fast, I wasn't expecting it and had to scramble to get my fuel wood on. Here's the fire chugging along. And the demo fire in the background of the still smoldering fire from the previous night. This is an oak, common oak I believe (Quercus Robur). This was under the same tree. And finally, we've always called this Lamb's Ear (Stachys Byzantina) but some of the pictures I found online don't seem to match this specific succulent. If someone believes this isn't the same, please let me know. On an aside, I've heard it makes great bushcraft toilet paper but have never run out of toilet paper in the woods and been desperate enough to actually try it. As the evening temperatures dropped into the low 30's, I decided to have a fire outside the Whelen. I rigged up an old feed bag I carried as an extra log carrier, mud barrier, etc, into a fire reflector. Lit with PJCB and fatwood, it was a nice warming fire that raised the temperature up nicely for a few hours and allowed me to warm up and sleep decently. We had arranged for a foraging class, so after a nice breakfast we ventured out into the trail system around us looking for different edible plants. We walked for a mile or so looking at all kinds of stuff like dandelions, mullein, mushrooms, green briar, river cane, etc. Plant and Tree ID. The majority of the group decided to reverse direction and look there, but I wanted to hike the 2ish miles back to camp. A decent walk in the somewhat moist piney woods. A fairly quick firewood party was requested, and we were able to gather up enough ash to last the evening. We huddled around and stocked wood most of the evening, knowing that tomorrow it would be a little warmer. Another quick fire was in order, but I fell asleep before it really took hold and warmed up the Whelen. Today was much warmer, and I was able to shed a few layers after breakfast and socializing. Packed up and I was home by 1. A very nice time, Thanks guys! Little hike to check on my camp after a storm, and a bit of foraging. Took the wife and the dog to check out a potential campout spot. The owners of this property said I could camp wherever I want, with two rules: 1: they don't want to be able to see the camp from their house (which is fine by me, I don't want to see their house from my camp! ) And #2: NO. FIRES. Which is a disappointment, but I understand because this area is full of long grass and overdue for a fire. So I'll cook over a camp stove. The pond is really high. Hopefully the fishing is still good. Another angle. I think I'll set my tarp up on that boulder or just below it. Forgot to take a picture, but there's no dead limbs or widowmakers in the trees. scoping out another potential spot. This is the rock pile you can see in the center right of the last picture. I doubt it'll be safe in the summer, I bet that pile is a haven for rattlesnakes. But, if I keep the tarp low enough, the owners won't have to see it. Closer up on the pond. That line of burdock is on the top edge of the bank. Sprocket running around where the pond flooded...watch out for the bank, Bubba! REPOSTING FROM OUTINGS THREAD: I got out today... breezy, misty on and off, temps just above freezing. Sounds like a nasty day, but I had a couple hours free and wanted to get out for a bit. This trip was to an area near Lake Ray Roberts, north of Dallas. Setting is a typical north Texas prairie / Post Oak forest. On arrival, just hitting the trail, and who do I encounter? I hiked in about 3/4 of a mile and set up a shelter to block the wind, using my ridgeline and a toggle to anchor the tarp to the tree. Fired up the alcohol burner inside a solo stove and got the coffee going. Lesson learned... this little burner wasn't producing enough heat on a cold day. I wasn't able to achieve a boil in the zebra pot, but the coffee came out OK in spite of it. After lunch and coffee it was starting to get dark, so I headed back in. It was a quiet day for the smaller birds, but on the way back to the car I did see a group of cormorants headed somewhere, followed by a great blue heron. The weather was pretty nasty, but the sights and activities made the day. Looking forward to getting out next time to keep working the skills. Young Blacksmith and notoiletpaperinthewoods like this. On this outing, I decided to mess around with a bow drill set. I wasn't successful this time but I will keep working on it. I started by taking some bankline and reverse wrapping it so it would be a better string for my bow and this seemed to work pretty well. I also had to use some tree identification to find out which trees would work for my bow drill. I saw a video where a guy uses these species and that's why I chose them specifically. I also made sure to get a good bit of wood ready for a fire that I eventually decided to make with a ferro rod but I didn't get any pictures of that. I completed this short outing with a nice cup of hot chocolate and the enjoyment of being out in the woods enjoying nature. I've been neglecting my Bushclass outings for a while, even though they're all I need to finish BC1 and I'm in the woods every week. Time fix it. Headed up my hill today in search of the components of a successful fire. This cedar bark will be good tender. I scraped it off with the back of my US made Camillus Bushcrafter. This one belonged to the famed @FIELDCRAFTLTC at one point. Got a nice one stick fire going from a pine branch. Looks like it's good. We use these car windshield shades as waterproof seats a lot. They're cheap after summer, light and waterproof. MrFixIt, beestokk and Young Blacksmith like this. Went with a buddy to scout out a location for the overnighter. Also looking to see what game animals are in the area. Used the tree knowledge to make a hardwood fire and cook lunch. I had some oil soaked cotton balls with me but didn't use them as I was able to strike natural tinder to get the fire going. MrFixIt, VikingWilderness and Kennebago like this. Here is my first outting. Working on identifying plants and hiking after the snow has turned the ground into pudding. The dogs had a close encounter with a skunk but no one was sprayed, so good ending. Great day out. 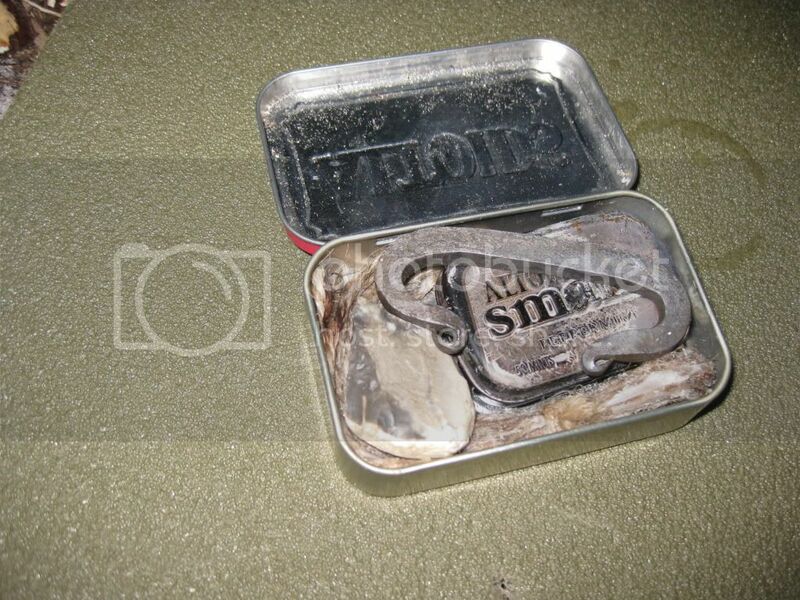 Snow Hike and Snow melt in my PSK Tin. Kicked hole in the snow for the fire braces. Twig Bundle to start on tea candle. Packed ti with snow and started warming. Things learned here and used, Twig Bundle, PSK, Brace for fire lay, Stay Hydrated. EDIT to Add: I used a tea candle to light this, my first time using one. Really small flame, will stick to PJCB's in the future, good to finally know. Don't know if this is going to count and would be happy to do another if needed but took my 1.5 year old on a little trip out to hike/bushcraft. Used my tree knowledge to harvest some leaves of the California Bay tree to make a tea later. Also had my kit on me including the paracord bracelet I made for the bush class. Nice morning out to do some bushcrafting. MrFixIt, Seahunter and Revinmama like this. Here is my second outing. Camera battery died and I only have a few pics. It was camping with Murphy's law weekend. Even though many things went wrong I was still out and had a great time. I blogged a bit about my failures on this trip if your interested. 3 day outing in Conecuh National Forest. Scouting for turkey (spring season). Not a lot of bushcraft on this trip. Setting up camp, gathering tinder and fuel for my gasifier wood stove. Knots used.....marlin spike hitch, bowline, taut-line hitches, trucker's hitch, and Prusik knots/loops with toogles. Sat up a flying diamond tarp over my hammock. Hiked in about 4 miles with add boiling water meals, Spam singles, Nutri-grain bars, and coffee. Cutting tools: parang chopper, belt knife, folding saw, and a smaller utility knife. Sawed a few pieces of red oak from a downed limb (4" diameter) after setting up camp to ensure I had enough fuel for my stove for the whole 3 days since thunderstorms were on the way. Split them up with my parang and a baton and stored them in my empty tarp stuff sack under my tarp to keep them dry. Found a fat lighter stump for quick tinder and gathered some cedar bark and processed it down to fine tinder material. Used my ferro rod to start the stove until my cedar bark ran out, then just lit the fat lighter with my bic lighter the rest of the time. I used a sawyer mini filter with a 64 oz bag to gather water from a spring head nearby. I only boiled water for my meals and coffee. Weather was 81 high, 40 low for the trip, with two bad thunderstorms the first night. No more rain over the next two days. 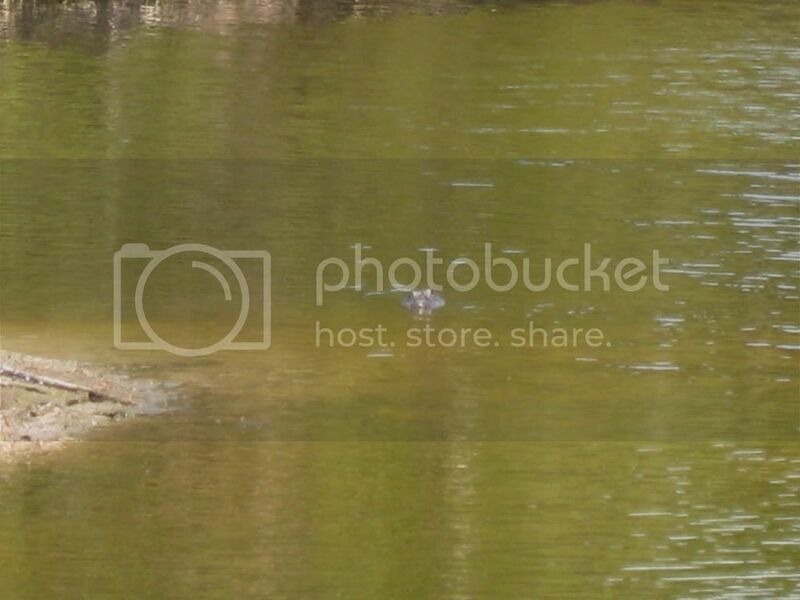 While scouting down by a large natural spring pond/lake, I encounter a pair of bald eagles fishing. I was captivated and watched them for a couple of hours. I tried to video, but it's not very good. It was a great trip....relaxing for an old broke-down retired Soldier. Part II The spring head where I gathered water and my oak working anvil for splitting wood. Added a shot of what some folks call and indian marker tree. Can't load the bald eagle video. It was a warm 74 degrees F and clear skys. Called up a buddy that owns a ranch in the area and asked if we could do some hiking on the property. After the two mile hike I made it to a small pond. There was an oak tree to rest against and I used to take my kid off my back. We had lunch and I worked on using man made tinders with a fire piston, charcloth, and jute. Was able to get a fire going pretty easily. We had an awesome day out. He played with rocks and sticks while I took in the afternoon. Teeps, MrFixIt and Seahunter like this. Met up with a fellow BCUSA member (@Seahunter ) to work on bush class items, look for edible plants, and animal tracks. Nice warm morning to practice items. We set up a couple of tarp shelters. He used a wood frame and some plastic sheeting. 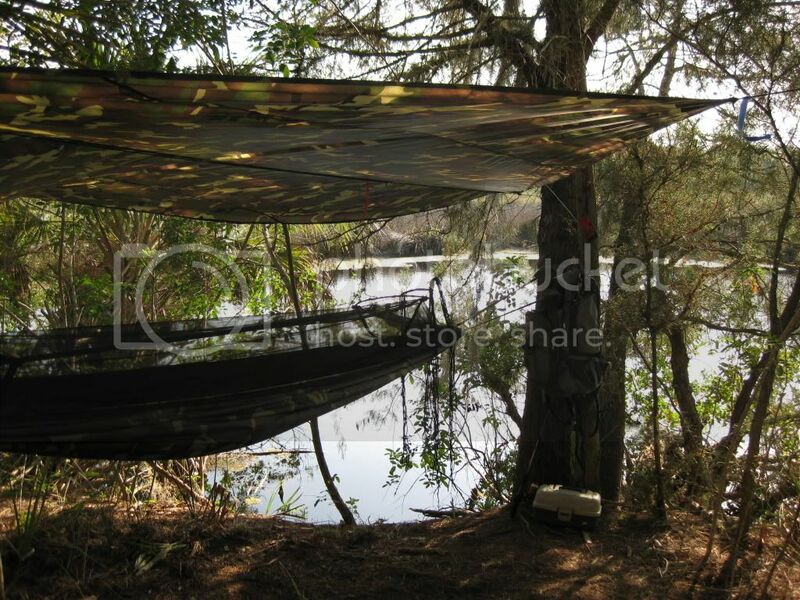 I used my BCUSA tarps with a pole made from a redwood tree branch. After taking the tarps down we got an ember with my fire piston pen. Really getting the hang on using the correct amount of force. He got out the bow drill kit and got an ember quicker than I thought it would take. I started working with the kit and also got an ember going. This was my first time trying a bow drill and was stoked to actually get an ember going. Just before the current warm spell hit us, I had the chance to go out winter camping once more. I had guests over and so we headed to a big lake near by to set up camp and enjoy winter wonderland! I went in by snowmobile to haul some of the camp gear, but the others went by dog team. We had a blast dog mushing, ice fishing, camp cooking, and practicing some bushcraft skills (we built a quick "Kochanski Supershelter", fashioned a bucksaw from branches, practiced our knots and worked on our fire starting skills. 5 days went by quickly! Four days later the sun and warm temps had metled all snow on the lake and the area became impassable due to water on top of the ice. Spring came about 4-5 weeks too early this year...crazy! Teeps and MrFixIt like this. I had been looking at a map of a certain area not far from home for some years, but never found the time (or energy) to actually go and check it out...other projects and destinations always were higher on the "to go" list. Not today though! It was full on bushwhacking plus the snow was deeper than we had anticipated based on what we saw around our house. Anyways, we only made it about 3.5 miles in over two hours, when we decided we had enough of this! We enjoyed the warm spring sun, had our trail lunch...when Claudia decided it was time to practice fire skills. So she pulled out her Leatherman and a ferro rod and we started gathering a variety of tinders in the area. After we had both started several fires using birch bark, feather sticks, dry grass, and spruce pitch, we headed home after a great day in the woods! A squirrel had beeen hanging mushrooms to dry in its cache tree. Not too long ago a moose had been laying here in the depression seen in the background. An overflowing creek made for challenging route finding. Peggy watches from a safe distance. Teeps, MrFixIt, oberKGBler and 1 other person like this. Wow. Good job. Give Peggy a pet for me. Teeps, MrFixIt and YukonMusher like this. Had an itch to scratch to get out in the woods. It has been far too long. Even though this is a little over 100 yds from my home I thought I'd scout out a place to set up a tarp, build a small fire pit and listen to the birds and squirrels. Whacked through some brush to a likely spot. An Eastern Red Cedar and a wild Bradford Pear I found that was around 16' apart. After using the sawback on my machete and removing vines/weeds from the ground this looks great. After all that work I decided a cold beverage was in order. The 2 photos above show my view. It's facing south since the majority of the wind and weather come out of the NW. I'll continue improvements in the next outing. Thanks for looking, and criticism/comments welcomed. BetterNotBitterIsSurvival, Rockgod1619, Teeps and 6 others like this. Good to see you out and about JD I like the looks of that chopper too. Teeps, MrFixIt and bacpacjac like this. The machete is a no name that came packaged with a Lansky puck. I decided to take a walk through the piney area of the national forest land by mine today. I knew I would find fatwood so that was part of the plan too. Also looking for signs of deer and turkey. Instantly I was greeted by all the wintergreen one could ever want. It didn't take long to find lots of fatwood. I mean lots. Ever had enough fatwood to just make an entire fire out of wet fatwood? I was a hungry man! BetterNotBitterIsSurvival and MrFixIt like this. Took a hike to a place I like to go. Cut some willow to make a handle for my Shovel, carved the Handle with the Shovel. Got into my PSK to set up a quick tarp. Put up one of the Snares I made, 1/16 7x7 cable, removed as soon as it was photographed. Hard to see, look in upper right hand corner and follow it down. A good day to be out and about. Took a drive up to a snow park to check the snow level, a few more weeks and I will be in the Mountains. Found some Punkwood, never tried to make a fire with it before. Fire Lay, Pitch on Cottonwood Bark, gathered there. Dinner was Rice and Beans. I will be back in the Hills in a week or two for my overnighter, the first of many this year.